Charlie Chaplin? Albert Einstein? János Plesch? Hans Albert Einstein? Eduard Einstein? Apocryphal? Is there any truth to this tale? Quote Investigator: The earliest evidence known to QI appeared in an article written by Charlie Chaplin for “Woman’s Home Companion” in October 1933 . The well-known comedian wrote a series of pieces for the magazine about his world travels, and his latest journey included a stay in Germany. Previously, when Einstein had traveled to the United States he had visited with Chaplin. Thus, Chaplin decided to reciprocate, and he went to the “modest flat” of Einstein where he was introduced to the scientist’s wife, daughter (a sculptress), and son. “But yours is more interesting,” he said humorously, comparing the two sketches. “We sat down to delicious home-baked tarts made by Mrs. Einstein. During the course of conversation, his son remarked on the psychology of the popularity of Einstein and myself. Einstein had two sons: Hans Albert Einstein and Eduard Einstein. QI does not know which son Chaplin meant to credit. A different tale about the origin of the quotation was later published by one of Einstein’s friends. See below for additional selected citations in chronological order. Once when Einstein was in Hollywood on a visit Chaplin drove him through the town. As the people on the sidewalks recognized two of their greatest, if very different, contemporaries, they gave them a tremendous reception which greatly astonished Einstein. “They’re cheering us both,” said Chaplin: “you because nobody understands you, and me because everybody understands me.” There was a good-humoured pride in his remark, and at the same time a certain humility as at a recognition of the difference between ready popularity and lasting greatness. Einstein wanted some solitude for his fiftieth birthday, a refuge from publicity. So in March 1929 he fled once again, as he had during the publication of his unified field theory paper of a few months earlier, to the gardener’s cottage of an estate on the Havel River owned by Janos Plesch, a flamboyant and gossipy Hungarian-born celebrity doctor who had added Einstein to his showcase collection of patient-friends. An episode which is amusing but in contrasting vein is told by the Hungarian doctor, Professor Johann Plesch (who discovered new methods of blood corpuscular measurements and the registration of blood pressure) in his book of memoirs Janos, The Story of a Doctor. When Einstein was in Hollywood in 1931, Charlie Chaplin invited him with his wife, his secretary, Helene Dukas and his assistant, Professor Walter Meyer (d. autumn 1948) to dinner in his villa and later to see in his private cinema a performance of the film City Lights. The footnote for this passage cited the Einstein biographies by Carl Seelig and Denis Brian for support. Fölsing, Albrecht. Albert Einstein. Trans. Ewald Osers. New York: Viking, 1997. In conclusion, the strongest and earliest evidence for this incident known to QI appeared in the 1933 article by Charlie Chaplin. The quotation about fame was ascribed to Albert Einstein’s son. QI does not know whether credit should be given to Hans Albert Einstein or Eduard Einstein. 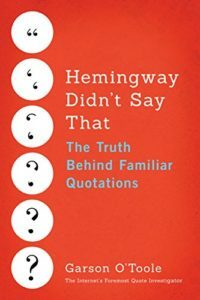 QI believes that the anecdote told in János Plesch’s memoir was probably inaccurate. Plesch was not a direct witness of the incident; whereas, Chaplin was a direct witness. Some important biographies of Einstein have relied on the testimony of Plesch either directly or indirectly. 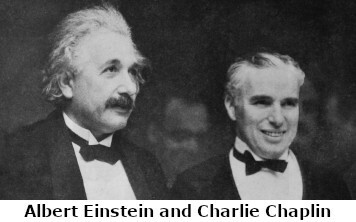 Image Notes: Albert Einstein and Charlie Chaplin at the City Lights movie premiere 1931. Public domain image from Photoplay periodical accessed via Wikimedia Commons.